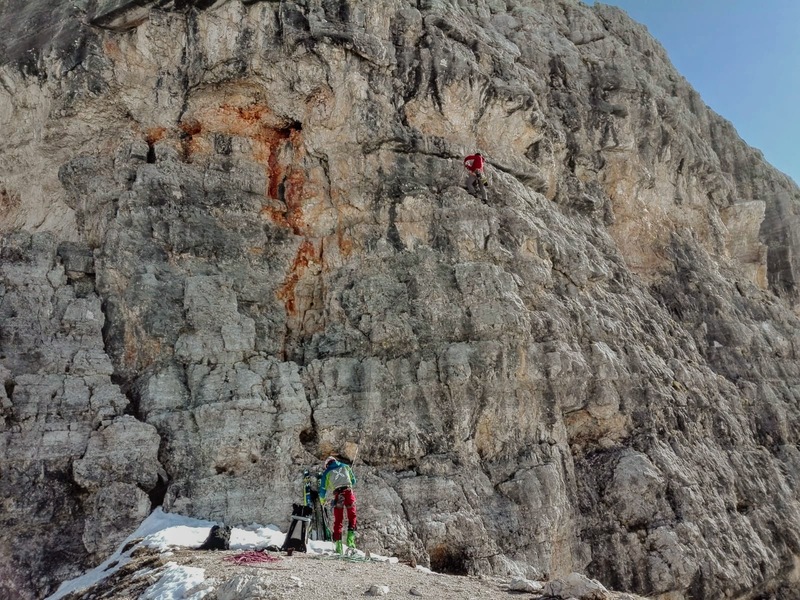 If you are looking for a simple route to warm up on, with fixed belays and some additional bolts en route, this 4-5 pitch climb is a great place to start. It’s easy to access, easy to retreat from should bad weather arrive and the descent is well marked and bolted. It also gets you operating at a modest altitude to help you adjust to the lower level of oxygen (even though it’s not much less) and if you are moving well should allow you to climb another at a similar grade nearby on the same day. It’s also a great option out of season when the towers are less crowded and because it is south facing can be completed in early spring (mid to late March) given the right conditions. There are several ways to approach the climb, season dependent. Park at the 5 Torri ski lift car park on the road from Cortina to Passo Falzarego. Take the lift either as a single or a return (12-16 Euro). Once at Rifugio Scoiattoli, the towers are a 150m away, walk down the path and find the bottom of the route which climbs up the arete of the closest tower. This option allows you to ski down in spring. By foot in 1.5-2 hours, by waking from Passo Falzarego, the 5 Torri car park or up the road to Rifugio Cinque Torri, or from Passo Giau. With a car you can drive to Rifugio Cinque Torri, although this is only possible when there is no snow and outside the month of August , when the road is closed between 9.30am and 5.30pm. During these hours a Navette bus service runs. There is a reasonable amount of fixed gear on this route. A set of nuts is useful, maybe 3-4 cams (BD #0.5-#1 most useful), some slings and of course extenders. In Late July and August it’s still worth taking a waterproof as storms frequently roll in during this period. The pitches are quite short and relatively easy after the second pitch although there are a couple of sections which are a little steep and airy. This only adds to the route in my opinion and really makes you feel as though you are climbing something worthwhile. Belays are on large, solid ring bolts, are frequent and obvious. Indeed the crux is also protected by such a bolt. 20m IV- After starting up a shallow groove in the arete of the tower, step right and climb towards an obvious overhang. Just below this you will find a number of bolts to belay. 25m IV+ Now climb right across a ledge to a break in the overhangs past a peg and then a bolt which denotes the crux of the route. Pull through the overhang (harder if you are short as the holds are quite high up) and then up past a bolt where you could belay if required or continue up a crack to a bolt below a large yellow corner. 25m IV- From the bolt, climb diagonally right up grey rock to a further overhang, bolt on the right, and another on the left. Step left over the void to pull through and then directly upwards to find a ring bolt. 40m III From here a number of routes are possible as you find your self on a wide slab. The correct route follows a series of corners and cracks up leftwards, you will find a number of ring bolts on the way, although it is easily possible to reach the summit of the tower from here in a 40m pitch. To descend you have two options. During the summer and when there are others on the route, it is imperative to follow the ring bolts down the northern side of the tower. 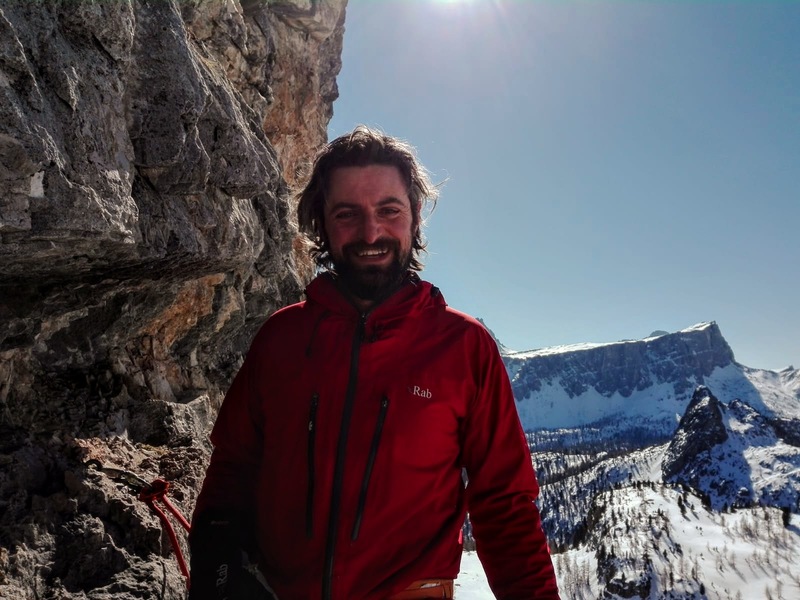 However, if there is nobody around in early or late season, it’s easy enough to descend the route so you stay in the warm and don’t have to tramp back through the snow to your skis.